Oh my goodness…John Harvey and Peter Robinson in the same room at the same time. 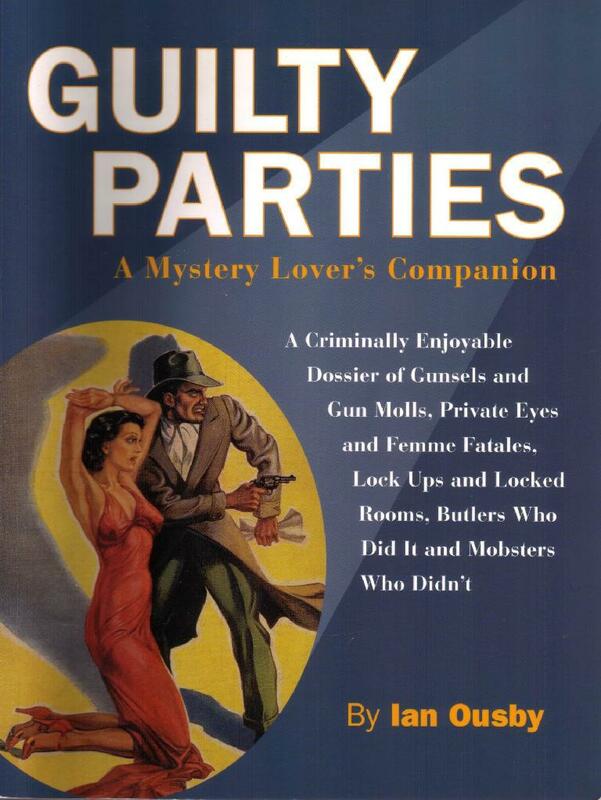 Marge and I were in bliss: these are our crime fiction rock stars! All the writers on this panel are keen music lovers; a couple even make music themselves from time to time. 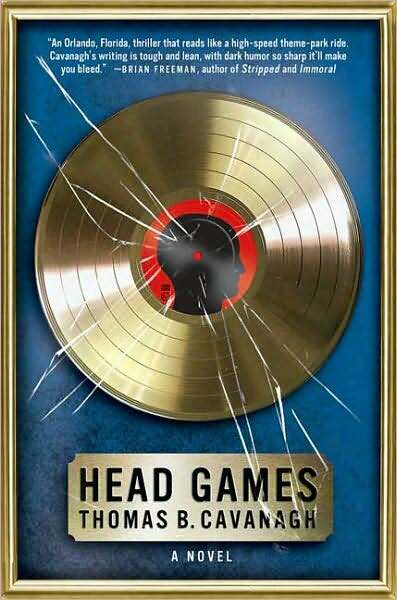 Most importantly, music plays a key role in their fiction. During the panel discussion, Tom Cavanagh observed that in the context of a novel, music serves to create or reinforce a mood, illuminate character, and affect the pace of events. 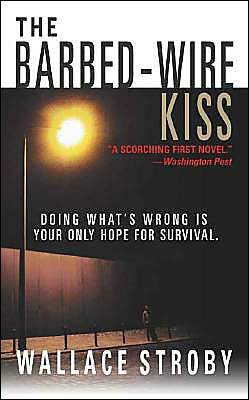 This first entry in Cavanagh’s Mike Garrity series was nominated for the Shamus Award for best hardback private eye novel of 2007. Next, comes Peter Robinson. 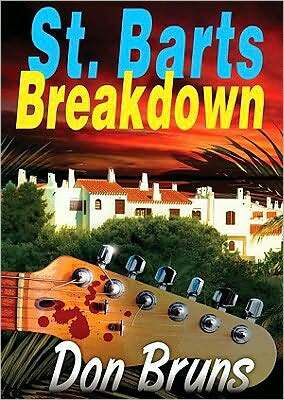 Robinson’s Alan Banks novels have a soundtrack all their own. Everything from Shostakovich symphonies to golden oldies from the fifies and sixties finds its way onto these richly varied playlists. Marge and I both have a longstanding loyalty to this superb series. The latest Alan Banks - Number 18! Don Bruns is a new name to me. Writer and musician, he brought his guitar along and played for us a fine song, composed by himself. 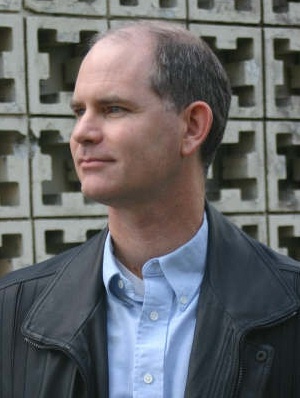 Bruns is the author of two series, one of which features Mick Sever, a journalist whose beat is rock music. 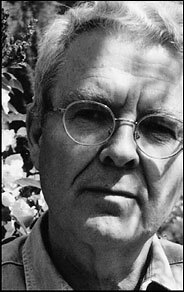 In addition he has edited, along with Claudia Bishop, several story collections. 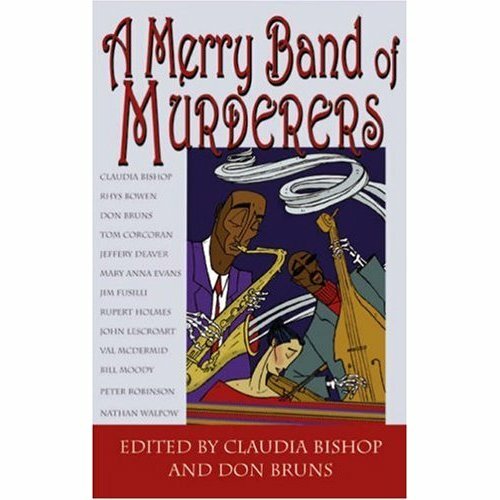 One, A Merry Band of Murderers, comes with a CD that features original numbers by each of the authors. Next to Don sat Roz Southey. 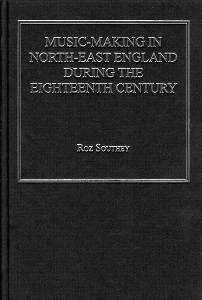 Roz really intrigued me, as she is a musicologist with a specialty in English music performance in eighteenth cenutry England. Not only that- she lives in the north of England, a region with which I am currently fascinated. I’m not a fan of supernatural elements in crime fiction. I find them superfluous and distracting. And if there’s anything I learned in my recent trips to England (three times in three years – I should be there now; I’m longing for the place) it is that ghosts are already everywhere. They don’t need to be invoked with such specificity. Okay – this may just be my own problem. 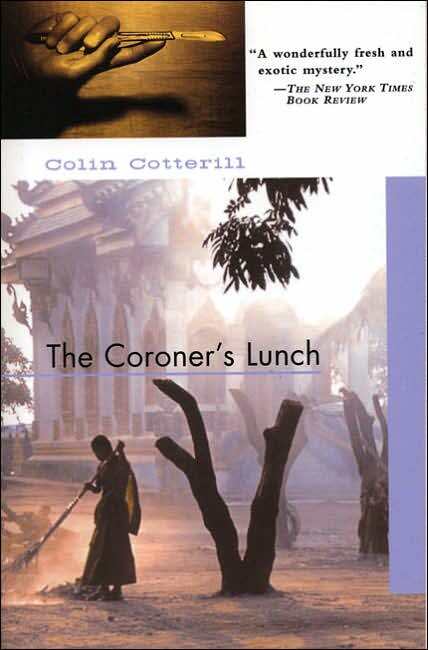 It’s the chief reason why, despite being utterly delighted by The Coroner’s Lunch, I chose not to continue with Colin Cotterill’s Dr. Siri Payboun series. Finally, we come to John Harvey. 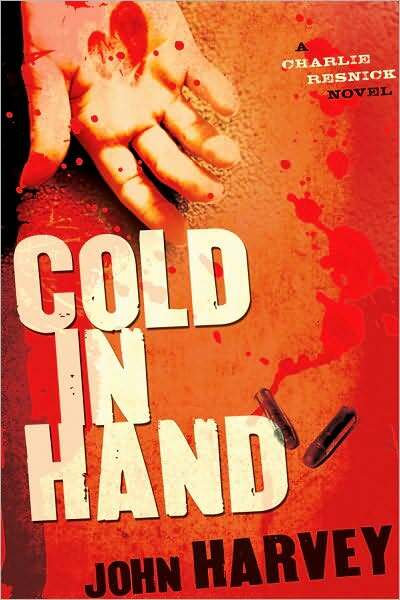 Harvey recently brought Charlie Resnick back as the protagonist in his latest crime fiction Cold in Hand. I almost wish he hadn’t. Out of respect for those who have not yet read it, I won’t say why. 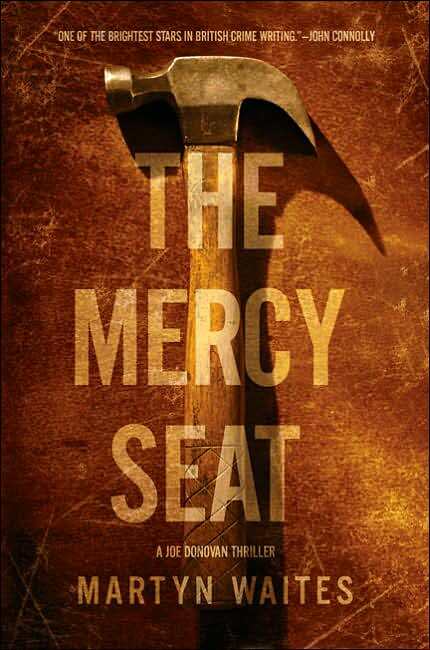 I’ll just that this is a terrific novel; please drop everything and read it now! Cold in Hand is suffused with a love of the American jazz greats of the forties and fifties. 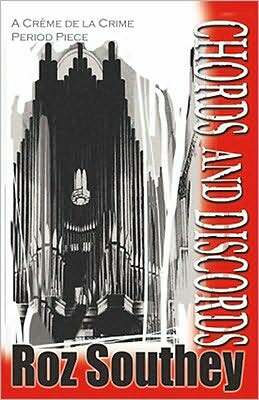 Harvey’s loving, meticulous descriptions of this music are both scholarly and compelling. I’ve always considered music a tough subject for the writer. If you love it – as my husband and I do – it’s hard to explain why. Like religious faith, it comes to you along a pathway that seems to bypass the intellect. One of the reasons we cherish music so is that it is living proof that there is more to us as human beings than what is contained in our rational minds. There can be no more compelling sound on the planet than a great orchestra ascending to the height of its powers. The final movement of Mahler’s First Symphony, or Tchaikovsky’s Fourth – Heaven storming! But can I say exactly why they affect me as they do? No. But for me, these treasures are beyond price. It’s the same for Charlie Resnick, with his love of the jazz masters. One of the many gifts I took away from Bouchercon was a work by British poet Stevie Smith. 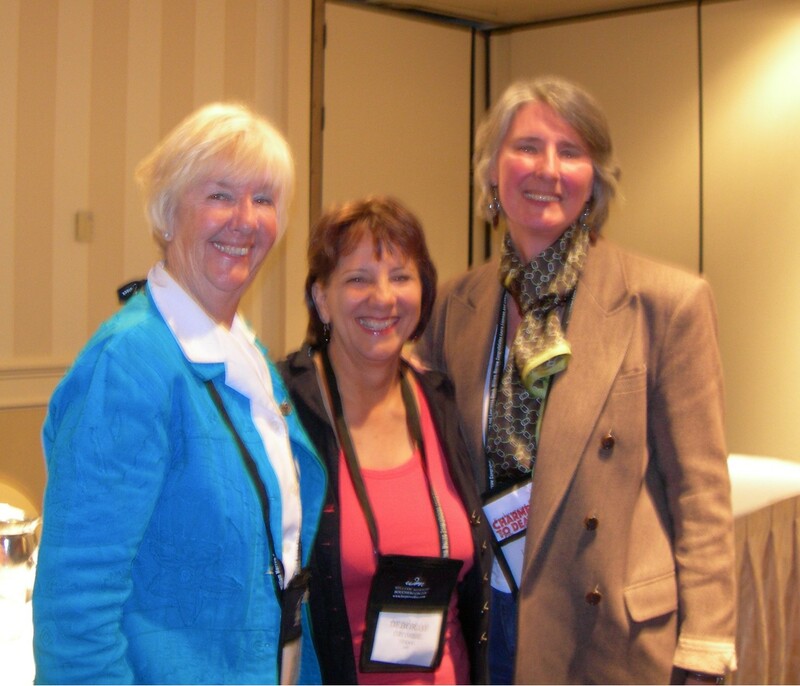 It happened on Friday Oct. 10 during one of our favorite sessions, “Come and Talk To Me: Three goddesses talking.” This was more of a spontaneous bull session than a panel discussion. The authors sat informally in front of the tables; the format worked wonderfully. The “goddesses” in question were Rhys Bowen, Deborah Crombie, and Louise Penny, wonderful writers all and terrifically entertaining to boot. There was a collective gasp from the audience. The image was so immediate; the words so terse and full of anguish, we were temporarily stunned into silence. No song title here – just a straightforward acknowledgment of Poe’s supreme importance to the history of crime fiction. She resides in Chagrin Falls, Ohio, which seems wonderfully appropriate, considering her area of specialization. Pettit is a sort of Poe groupie (as you might surmise from the above picture). 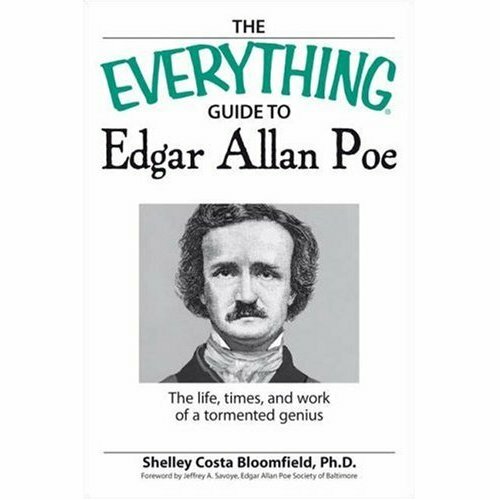 He maintains a blog on which, among other things, he champions the claim the city Philadelphia has to the furthering of Poe’s genius – and even to his remains! He rode this hobby horse humorously and enthusiastically throughout the session. This panel was like a really good college seminar, the kind that made you feel as though someone had opened the top of your head and was pouring great stuff – legal stuff! – into your brain. 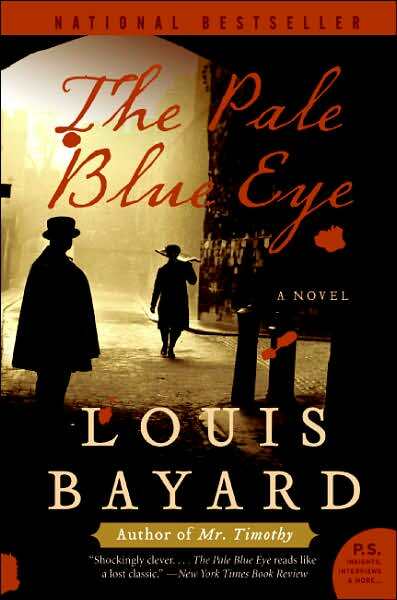 I was particularly delighted to see Louis Bayard, whose novel The Pale Blue Eye so powerfully evoked Poe’s brief tenure at West Point. 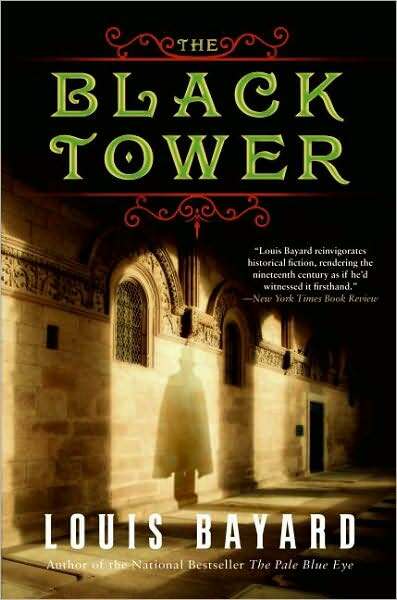 Bayard’s newest work, The Black Tower, is set in Paris and features Eugene Francois Vidocq as the main character. Bayard said that he had become familiar with Vidocq while doing research on Poe. I first heard of the renowned – if at times, slippery! – founder of France’s Surete Nationale (now called Police Nationale) from Guilty Parties, the colorful survey of the history of crime fiction by the late Ian Ousby. 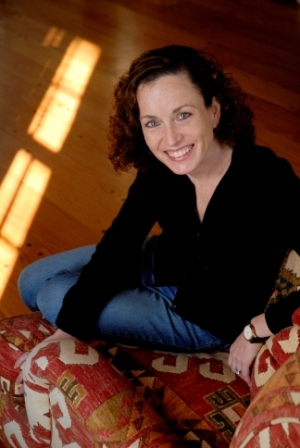 Shelley Costa remarked on the breadth of Poe’s influence on subsequent authors of horror tales and detective fiction. It’s hard, she continued, to overemphasize Poe’s centrality to the history of American literature, despite the fact that his tales seem to float free of a specific time and place. 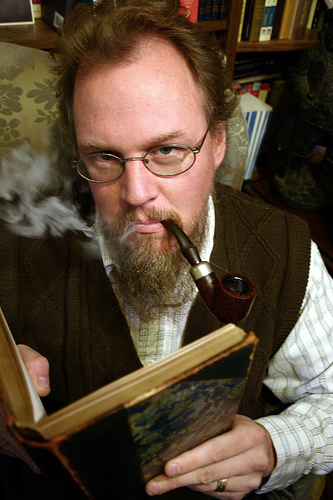 Daniel Stashower read Poe as a child and found, upon returning to his work as an adult, that it retained its power to thrill and terrify him. 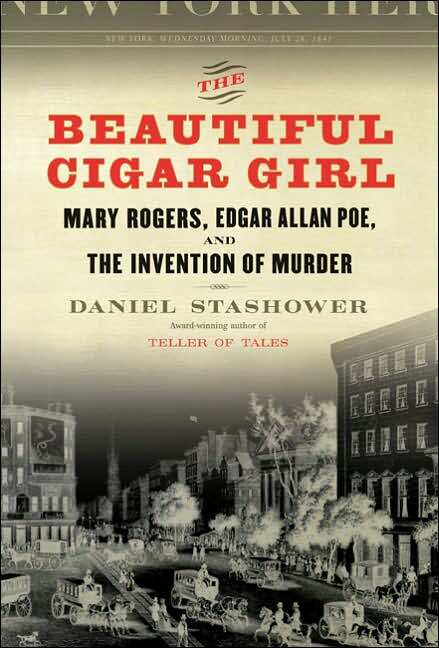 I am currently half way through Stashower’s book on Poe and the murder of Mary Rogers. Poe was known to have been influenced by a multi-volume chronicle of true crime variously called the Newgate Calendar or Malefactor’s Bloody Register. Who wouldn’t be curious about a work so titled?! Two stories were singled out that I haven’t read and would now like to: “The Narrative of Arthur Gordon Pym” and “The Imp of the Perverse.” The latter apparently illustrates Poe’s unfortunate tendency to shoot himself in the foot with regard to his own best interests. Louis Bayard stated that Poe was neither a naturalist or a realist. He was primarily interested in fugue states, or “dark symbolic constructs.” Marvelous locution, that, and illustrative of the bracingly high tenor of this panel discussion. 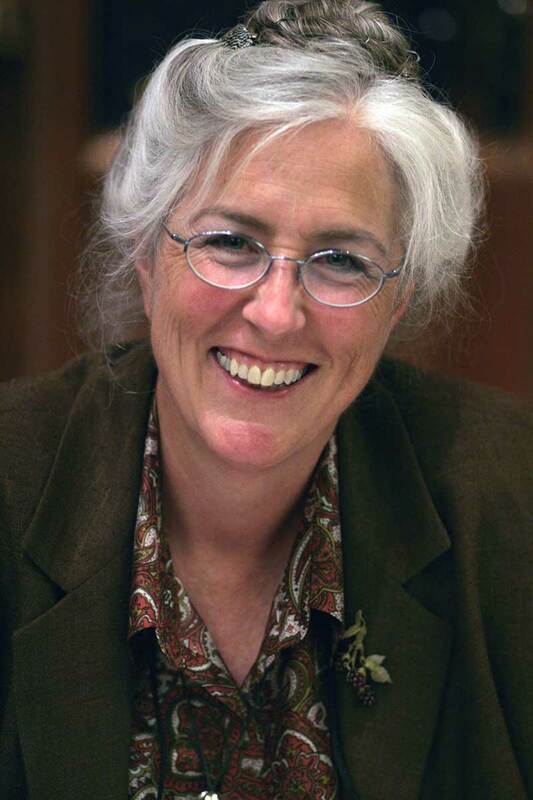 Click here for video of the Lawrence Block interview (which we attended), a video tribute to Block, an interview with Barbara Peters and Robert Rosenwald, and finally John Harvey interviewed by Otto Penzler. Five different versions of “Down in the Hole” were recorded for the opening credits of each of the The Wire‘s five seasons. I liked best the one performed for the fourth season. It sounds the least professional – like a couple of kids from the ‘hood trying to get it together. The artists, a group called DoMaJe, are identified by the HBO store as “a group of Baltimore teenagers.” I could find no other information about them. 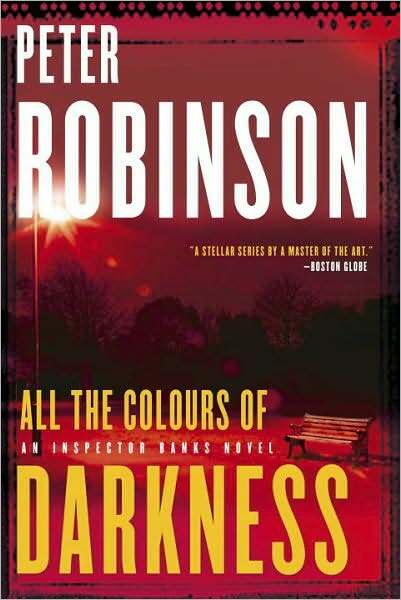 Yes – THAT Peter Robinson – author of the Alan Banks series! 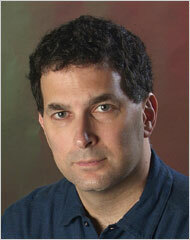 Marge’s and my mystery-writing idol! 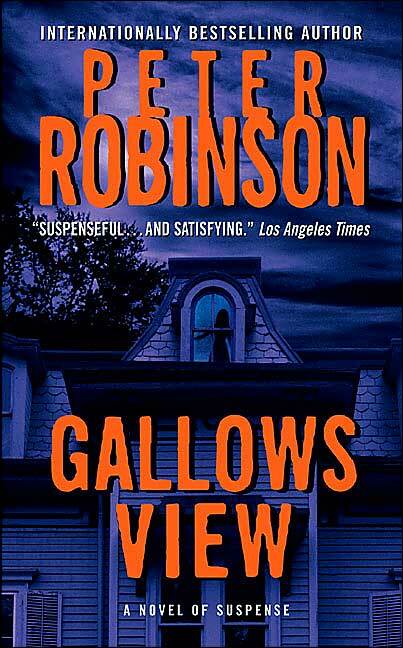 We’ve been reading this fine series ever since Gallows View came out in 1987 and haven’t missed once since. Well, I could go on – but you get the idea. 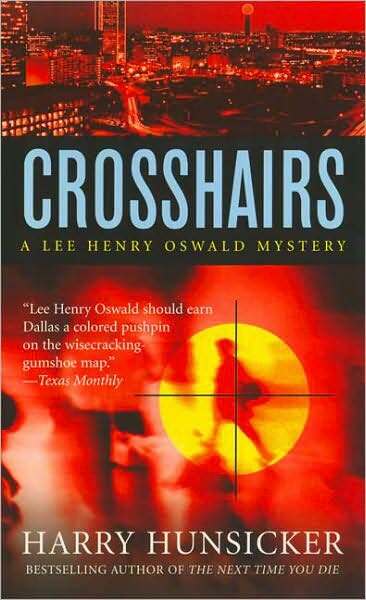 At one point, the panel was asked why viewers found drug dealers and killers to be such compelling characters.. Wallace Stroby observed that “Every villain is the hero of his own story.” (Spoken like a true crime novelist!) The series is marked by a combination of a mordant wit and violence which sometimes built up slowly and at other times comes out of nowhere in a way that is both shocking and terrifying., The stories reflect a complete lack of sentimentality and the almost total futility of good intentions. Some viewers could not stomach the violence in The Wire, and I can understand and sympathize with that aversion. There were times when I wanted to turn my face away – and, in fact, did. But even worse than the actual physical violence was the violence done to people’s lives – the blighted childhoods and the lives ruined by prostitution and drugs. Amid all the devastation, there is one powerful redemption that occurs near the end of the show. It brought tears to my eyes; I had been desperately hoping it would come to pass, and was profoundly grateful when it did. 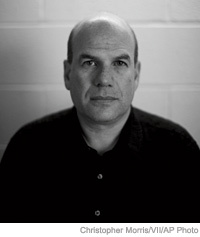 The Wire is David Simon‘s baby, and he deserves all due credit for it, and for bringing on board such world class crime writers as Richard Price, George Pelecanos, and Dennis Lehane. Between the fabulous performances, the terrific dialog, and completely absorbing stories -a triumph. All were most entertaining and enlightening on the subject of their craft. Alison Gaylin’s work in entertainment journalism has obviously yielded plenty of material for her fiction. I have to say, though, that at this particular panel, the handsome and genial Martyn Waites all but stole the show. 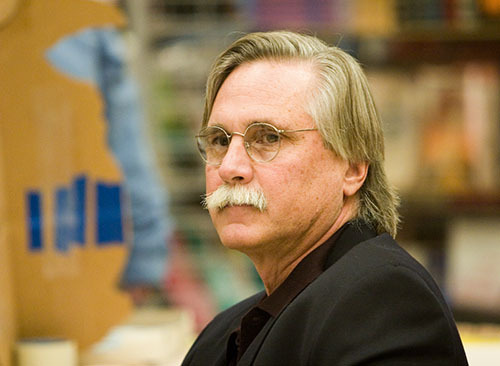 In addition to being a novelist, he has worked in theatre and television, and also done stand-up comedy. It showed – his stories were hilarious! 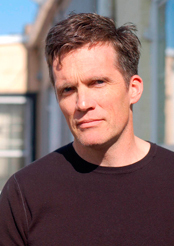 Rennie Airth writes the John Madden mysteries. Madden is a shell shocked World War One veteran. 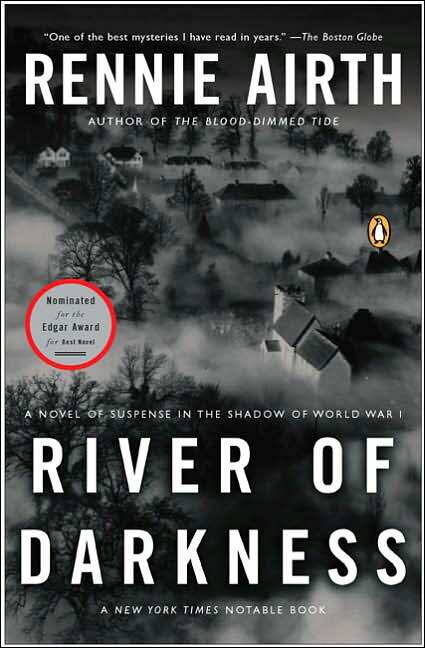 I read and enjoyed the first novel in this series, River of Darkness (1991). 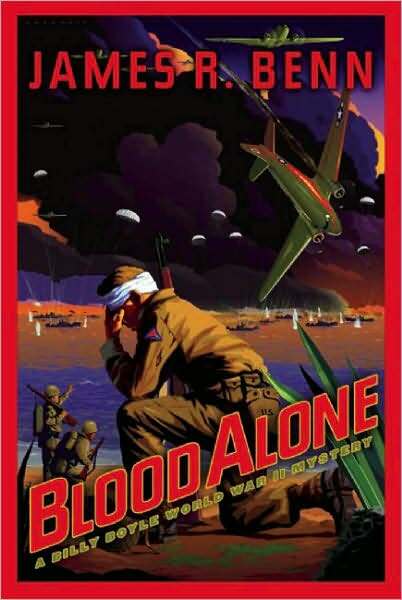 The second was Blood-Dimmed Tide (2001), and the third, Dead of Winter, is due out next year. Sharan Newman writes a popular series set in France in the Middle Ages and featuring Catherine LeVendeur, a scholar and novice nun. 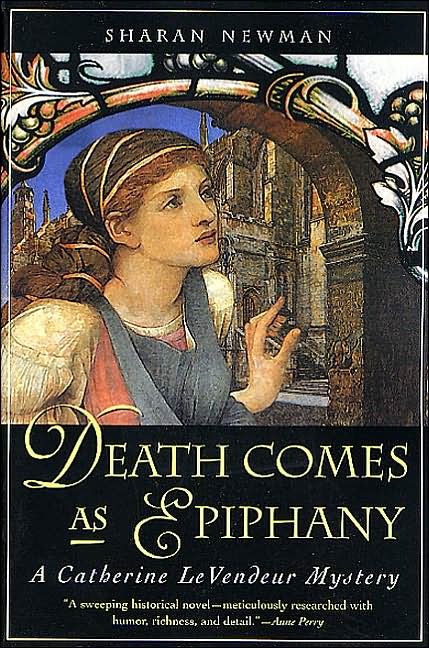 I read the first one, Death Comes As Epiphany, and enjoyed it a great deal. Newman has recently published Shanghai Tunnel, a novel set in Portland, Oregon, in the nineteenth century. 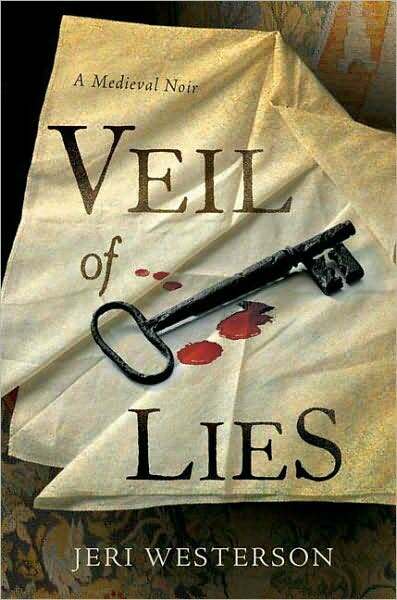 Jeri Westerson’s debut novel is Veil of Lies: A Medieval Noir. It is the recipient of an enthusiastic starred review in Library Journal. This was a great discussion. The authors were most articulate as they described the challenges of researching their respective periods, and then integrating that research into their novels in a manner that was effective but not intrusive. They mentioned some interesting potential stumbling blocks. For instance, Charles Todd was going to refer to the first Queen Elizabeth as “Elizabeth I.” Well, that doesn’t work when you’re writing about England in the 1920’s. Up until that point in time, there was simply “Queen Elizabeth.” And in fact, until the abdication of Edward VIII (latterly known as the Duke of Windsor) in 1936, the British had no reason to think there would be an Elizabeth II in their future. Both Charles Todd and Rennie Airth have familial connections to the First World War. Airth sung the praises of the British Library as a source of materials bearing on “the Great War.” He recommended The Long Weekend: A Social History of Great Britain (1918-1939) by Robert Graves and Alan Hodge. 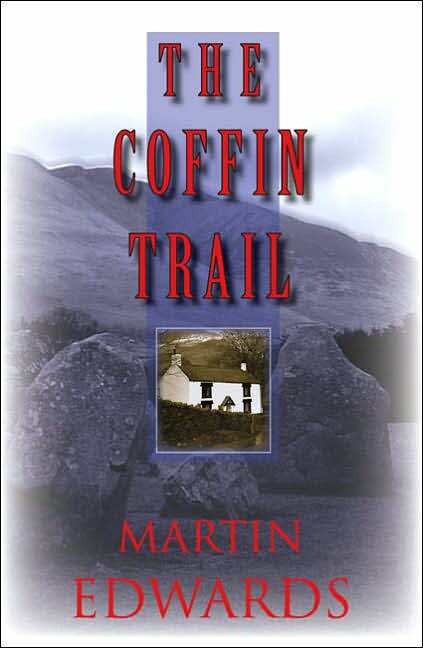 The work of historian Lyn Macdonald was praised for its vivid first hand accounts by veterans of the conflict. Growing up amid the great storytelling traditions of the South had a profound influence on Charles Todd. 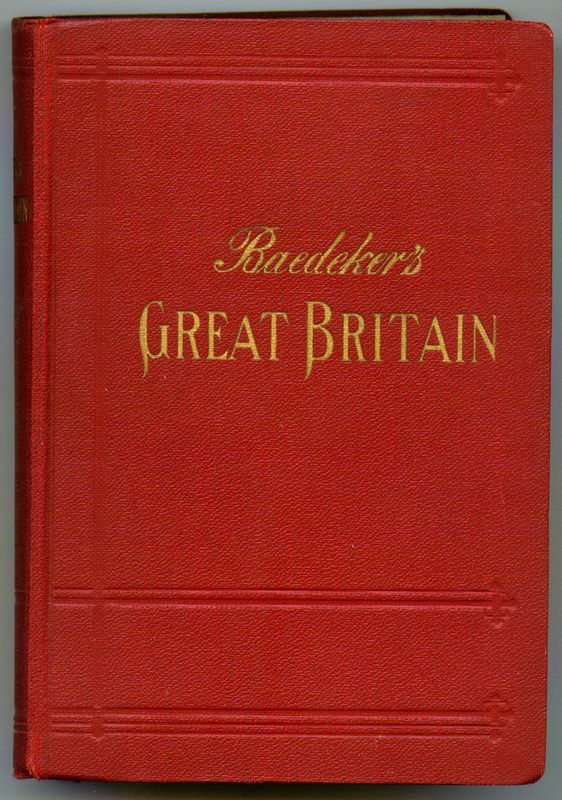 He offered this poignant observation about the soldiers of the First World War: “They just went off to war and didn’t ask why.” Todd, Benn, and Airth all agreed that letters from the early 20th century and genealogies were enormously helpful – also “there’s no substitute for going to the place and talking to the people.” All three were immensely grateful for the amount of archival material now available online. Newman recommends sermons for historical research: “If someone is preaching against something, then it’s a good bet that folks are doing that something!” Go to SharanNewman.com for terrific links to sites concerned with medieval history and literature. Jeri Westerman told a great story about her effort to attain an authentic feel in her description of medieval swordplay. She positioned a side of beef in her backyard and stabbed it repeatedly – all the while hoping the neighbors were not watching! One of the many privileges that Marge and I enjoyed as Bouchercon attendees was the chance to cast our vote for the 2008 Anthony Awards. As is usually the case with Your Faithful Blogger, virtually no one that I voted for won! That’s okay – all were deserving. Click here to see the nominees and winners. 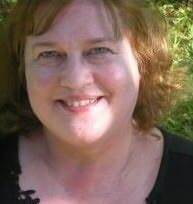 O joy – a Laurie R. King sighting! 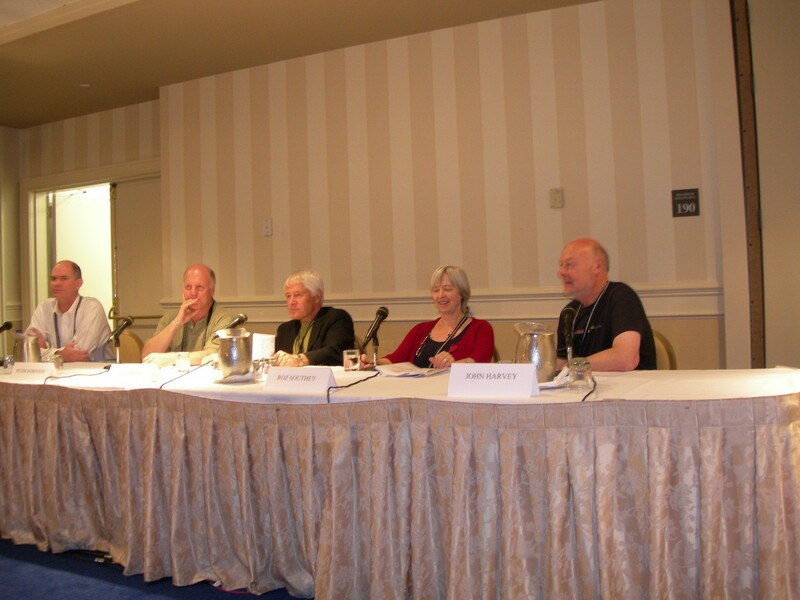 From time to time at Bouchercon, my whole being would light up as I recognized a long admired author – “There’s ____ in the flesh!” The first time it happened was when we walked into the room where the “Living in the Past” panel was to be held. 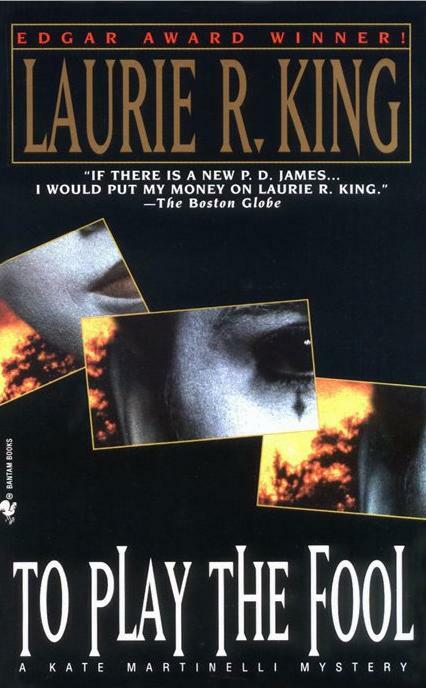 And by golly, there at the front of the room was Laurie R. King. 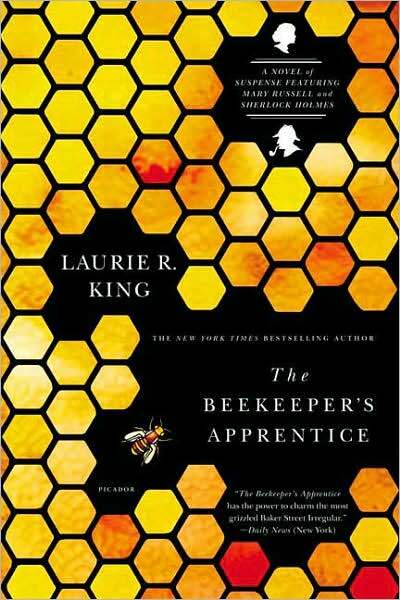 Laurie King is the author of two novels that I cherish: The Beekeeper’s Apprentice and A Monstrous Regiment of Women. (The title of the latter comes from a treatise by John Knox, published in 1558.) They’re the first two entries in her Mary Russell/Sherlock Holmes series. 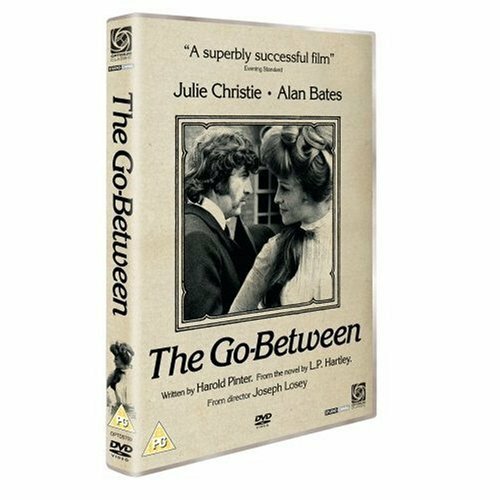 I still recall vividly the opening scene in Beekeeper, in which a disconsolate Mary, wandering the Sussex Downs, nearly trips over The Great Detective, who is crouched in the shrubbery observing the activities of a swarm of bees. From that moment, King had me in her writerly thrall. I could not wait to see what fate awaited the awkward, bookish adolescent and the celebrated, if highly eccentric, sleuth. The arc of the plot that begins in Beekeeper and culminates in Regiment is a masterpiece of artful, yet seemingly artless, storytelling. I have to say that I struggled through the third book, A Letter of Mary. 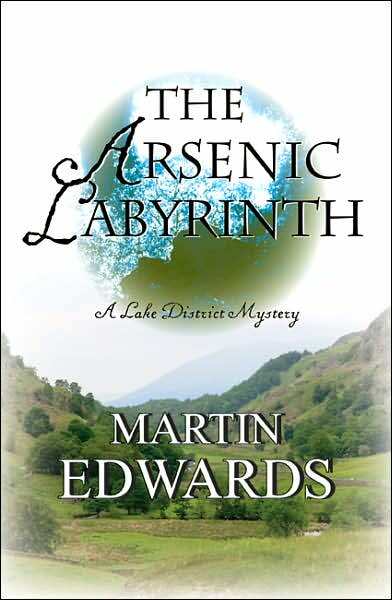 If memory serves, the story was good and the writing was excellent – I expect no less from this author – but the novel lacked the high drama of the first two series entries. At that point, I basically “went off” this series, but in 2005, when Locked Rooms came out, I was sufficiently intrigued by the reviews to jump back in. 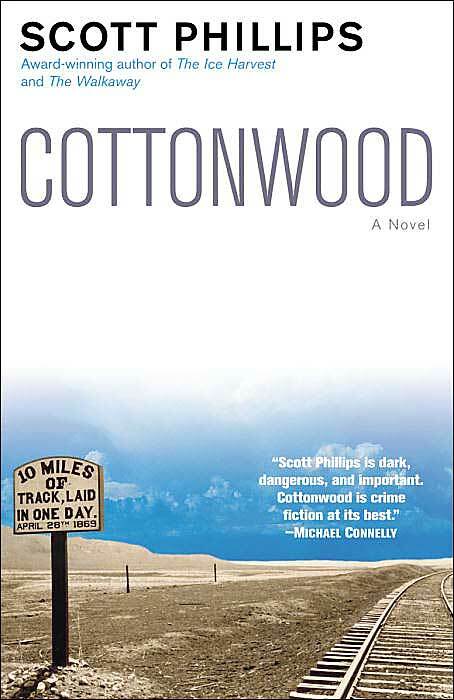 I really enjoyed this novel! Laurie King can be very cunning, and the way she wove a famous writer of the period into this tale was cunning indeed, and deeply satisfying – at least, to this reader. I remember having one reservation, though. 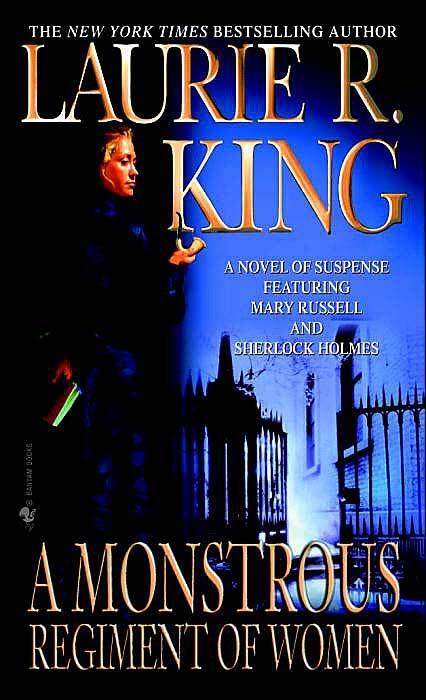 It had to do with the relationship between Mary Russell and Sherlock Holmes. I am well aware that theirs is a marriage of true minds, but I would like to have seen some genuine display of affection between these two admittedly cerebral individuals. I was somewhat surprised when I looked King up on Stop! 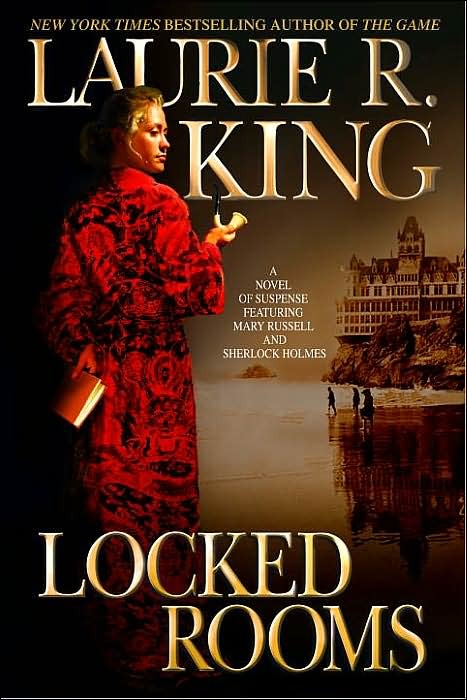 You’re Killing Me and found that Locked Rooms is the most recent in the ongoing saga of Russell and Holmes. King has published a standalone in the meantime, Touchstone, which I have not yet read. 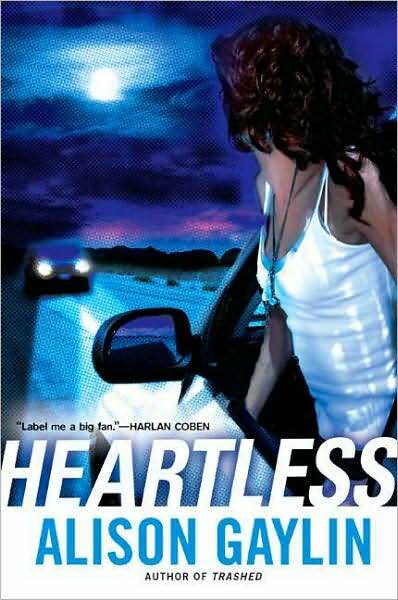 She also has a contemporary series featuring Kate Martinelli, a policewoman in San Francisco. 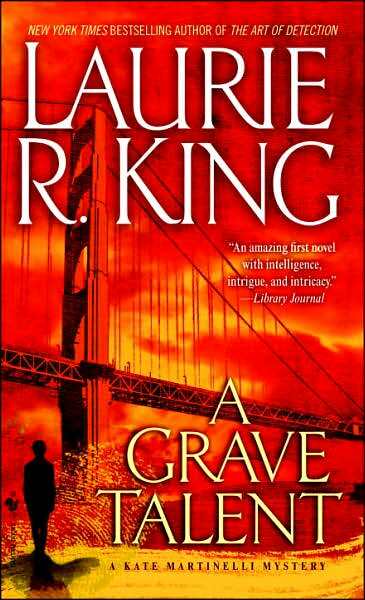 The first book in that series, A Grave Talent, came out in 1993, a year prior to The Beekeeper’s Apprentice. It garnered several awards and nominations, but I was not able to get through it. I did enjoy the sequel, To Play the Fool. 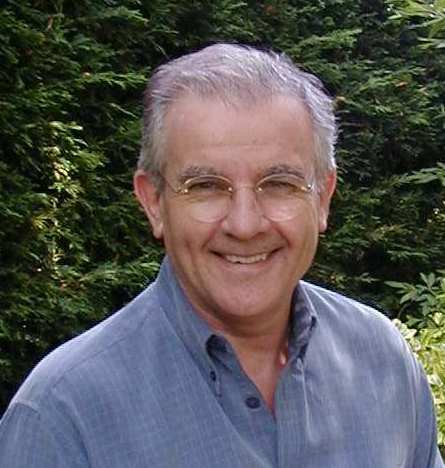 The fifth book in the series, The Art of Detection, came out in 2006. 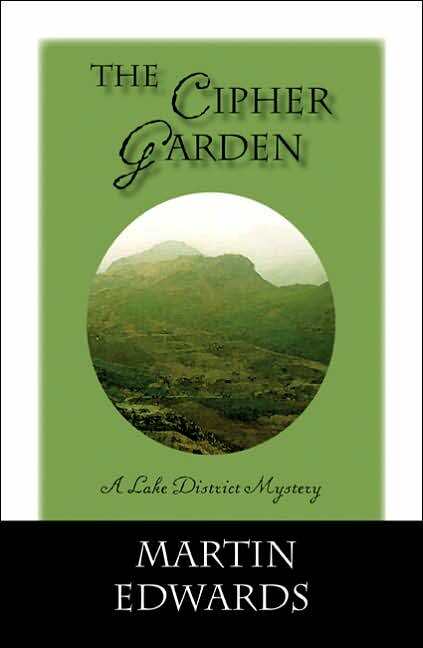 IMHO, these books, while engaging and well written, do not have the magic of the Mary Russell novels. 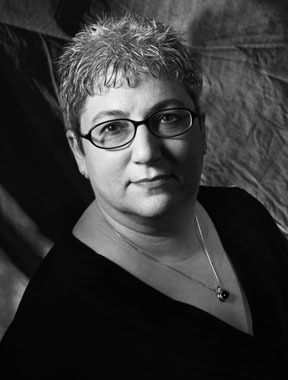 At any rate, with her magisterial bearing, keen intellect, and ready wit, Laurie King was an ideal choice to moderate “Living in the Past” – about which, more coming, and soon! 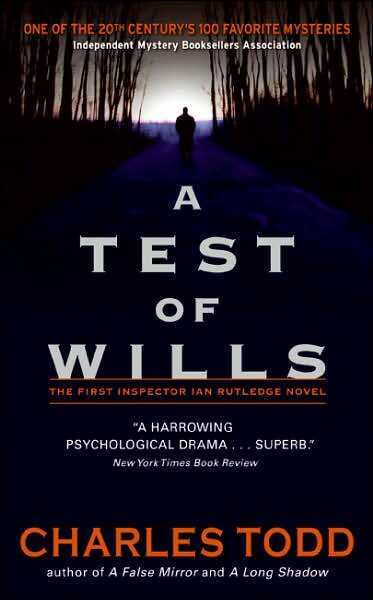 Of these four, I had only read one novel by one of the authors: A Place of Execution by Val McDermid. I knew of Colin Harrison but had not read him. I had barely heard of Chris Knopf. Adrian Magson, whose name was entirely new to me, lives in Oxfordshire and is a columnist for Writing Magazine in the UK. 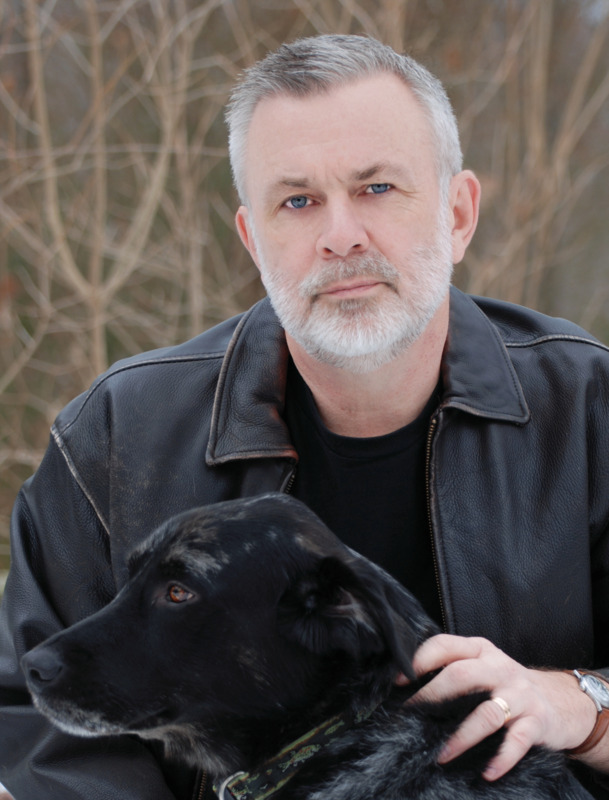 He likes to tackle topical issues in his fiction; his latest, No Kiss for the Devil, concerns the murky activities of certain Russian oligarchs. I thought it sounded interesting, and I enjoyed making the acquaintance of this genial, articulate man. So, just what did the quartet of crime writers talk about? They started by discussing rules – and the breaking of them! There’s no way I can convey, in an orderly way, just how things progressed from there. My notes look like a gigantic scribble! I can tell you that at one point, the question was posed as to how far you can go into a dark place before you actively repulse the reader. Obviously, that depends on who that reader is! One of the participants warned the others against describing anything nasty done to an animal. That’s when you get the hate mail! Well, I have to say that for this reader, that really is a hard and fast rule. 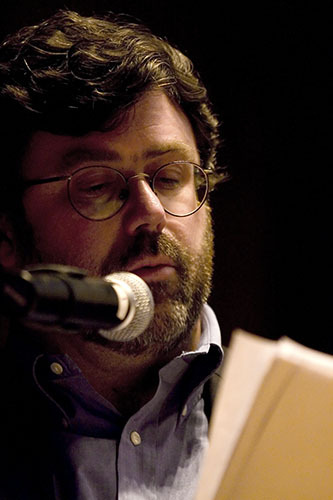 Toward the end of the panel’s allotted hour, George Easter posed the question as to which writers had most influenced the participants. 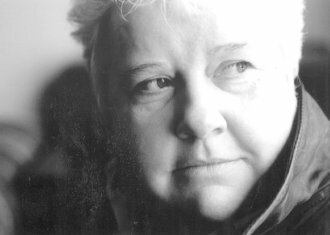 Without hesitation, Val McDermid, a Scot, said Robert Louis Stevenson. When we were in Edinburgh last year, Ian Rankin said the same thing. I am only now beginning to realize what a huge influence Stevenson has had on Scottish literature. I heartily recommend reading, or re-reading, Dr. Jekyll and Mr. Hyde. I did so last year and was amazed at the punch still packed by that slender volume. 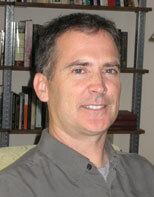 Chris Knopf cited the hardboiled masters Raymond Chandler and Dashiell Hammett. 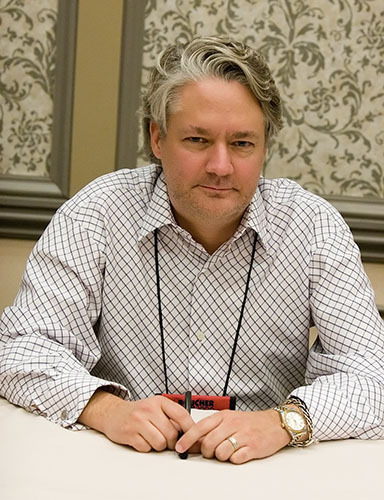 Adrian Magson mentioned Leslie Charteris (“The Saint”) and Mickey Spillane, as well as Western writers Louis L’Amour and Zane Grey, whose storytelling prowess he remembered vividly. 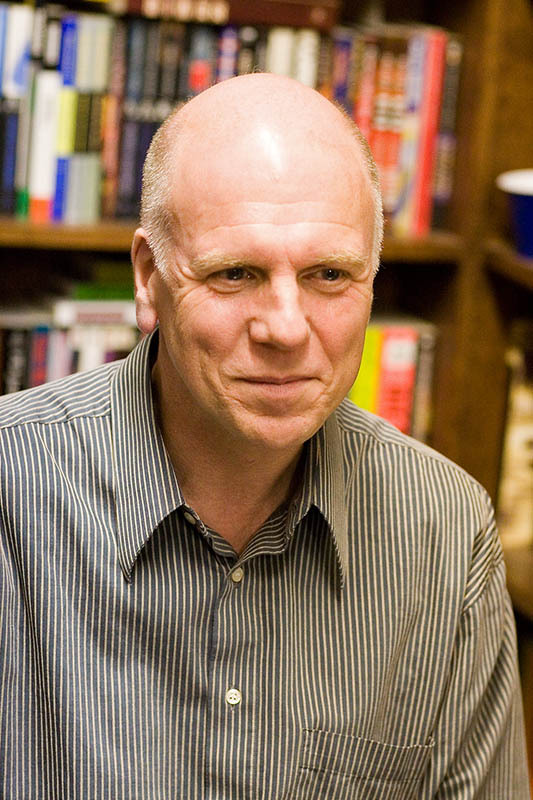 As for Colin Harrison, who has read widely and eclectically his whole life – everything and everyone from Batman to Shakespeare!